Every now and then you want comfort food. That good, flavorful, tasty, sure-to-do-damage-to-your-waistline food. Food that has been fried, or battered and deep fried (yaay! ), or full of cheese, or covered in gravy…Food that makes you want to undo your pants, melt into the couch and sigh contentedly. That was me, this morning. I wanted something good, and not necessarily good for me. I try to make healthy, tasty meals for my family all the time but this morning I could’ve cared less about the caloric count. I broke out the grits. 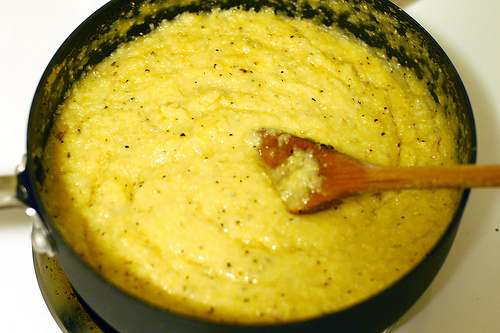 Aww yeah, time for cheesy grits, baby. Image courtesy of Hope 4 Peyton. I would have taken a photo of my own pot of grits, but there was no time. Bring the water to a brisk boil in a small pot over high heat. Add the grits, salt, sugar, butter and paprika to the boiling water. Turn the heat to low, stir and cover. Cook over low heat for five minutes, stirring occasionally. After five minutes, turn off the heat, stir, and re-cover. Wait five minutes then add half of the cheese, stir and re-cover. Wait five more minutes, add the rest of the cheese and stir again. Serve immediately. Now, the greedy fat pig in me could eat the entire pot full by myself, right out of the pot. But I had to share because Brad and Talia were awake. Dang kids. Always being hungry and wanting food and attention and stuff. Sigh. What do you like to make for comfort food? Let me know, leave a comment below!